We’re only a few weeks into Term two and we’ve already reached a milestone in our Play for Fun programme! The first three Play for Fun attendees have earned their exclusive black reward t-shirt for getting 20 stamps on their Play for Fun loyalty card. 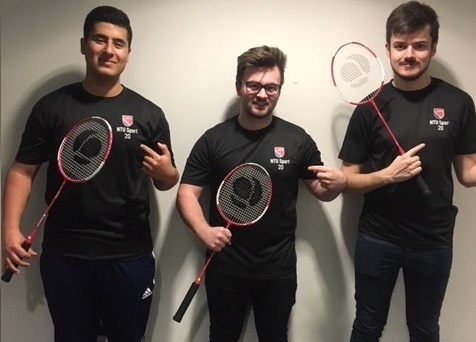 Hussain Jaward, Edward Mower and Thomas Durford have attended regular Badminton sessions and in turn have soared through the reward programme. Before they began to attend our Badminton sessions, Hussain, Ed and Tom didn’t know each other, and have since become good friends through regularly attending the sessions, showing that Play for Fun is more than just about sport – you can make friends too! We spoke to all three of them and asked why they enjoyed coming to the sessions so much. Hussain said: “I have never enjoyed myself as much as I have coming to the badminton sessions”. Tom continued: “The sessions are full of fun and games, I’ve got to meet new people and make some good friends” and Ed simply responded, “I love the sport”. It’s not too late to come and join the fun. There are 32 sessions covering a variety of sports across all campuses for you to get involved in – check out our full timetable for Term Two. You only need to attend 5 sessions to get your first loyalty reward, a pink t-shirt, followed by flip flops when you’ve attended 10 sessions. Pick up your reward card from reception at City Sports Centre or Lee Westwood Sports Centre when you attend your next session.